This study was realized to investigate whether there is any effect of visual (video) feedback on the academic achievement of 41 volunteer students (23 male, 18 female )in the teaching basketball skills. Student t test was applied to the data obtained for independent groups. According to the participation in visual feedback activities, there was no significant difference between academic achievements of female experimental and control groups (p>0.05) while significant differences were detected statistically (p<0.05) between academic achievements of male experimental and control groups. As a result, the application of visual feedback was recommended for teaching all skill teaching since it has positive effects on the status of academic achievement. üzerinde gerçekleştirildi. Elde edilen verilere bağımsız gruplar için Student t testi uygulanmıştır. dolayı tüm beceri alanlarının öğretiminde uygulanması önerilmektedir. Erden, M., Akman, Y. (2001) Gelişim ve Öğrenme. 10. Baskı. Ankara: Arkadaş Yayınevi. 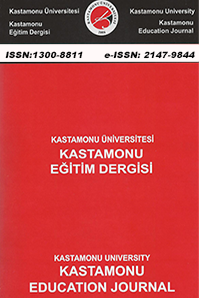 Guadognolı, M., Holcomb, W., Dawis, M. (2002). The Efficacy of Video Feedback for Learning the Golf Swing, Journal of Sports Sciences, (20): 615-622. James, P. (1971). Videofeedback in Learning Begining Tranpoline, Perceptual Motor Skills, 32:669-670. Messier, S.P., Cirillo, K.J. (1989). Effects of Verbal and Visual Feedback System on Running Technique, Perceived Exertion and Running Economy in Female Novice Runners. Journal of Sports Science, Summer, 7(2):113-126. Selder, D.J Del Rolan, N, (1979). Knowledge of Performance Skill Level and Performance on a Balance Beam” Canadian Journal of Appllied Sport Science, sayı:4, p:229-236. Urartu, U. (1990) Basketbolda Teknik -Taktik-Kondisyon, İnkılap Kitabevi, İstanbul, s:171-173. ISNAD ÖZEN, Yener . "Görsel Geri Bildirimin Basketbol Becerilerinin Öğretiminde Etkisi". Kastamonu Eğitim Dergisi 25 / 2 (March 2017): 677-688.